Hereford Road restaurant is a very straightforward kind of place. It’s in Hereford Road for a start, so there’s no margin for confusion about where you are or where you’re going. At my age, I like that kind of thing. It’s reassuring. What I don’t like is, say, a restaurant called the Red Fort that is clearly not and never has been a fortified military compound built of crimson stone. That’s too confusing for government targeted, middle class, middle aged serial wine abusers such as S and I. We’re off our heads on chablis half the time. We need all the help we can get to find these restaurants, stagger in, order more Louis Jadot and throw a brick at a pensioner before the starter arrives. That’s why it’s always best to keep things simple and thankfully, here is a restaurant that does exactly that. Hereford Road has been opened by Tom Pemberton, who previously worked as the head chef at St John Bread & Wine. 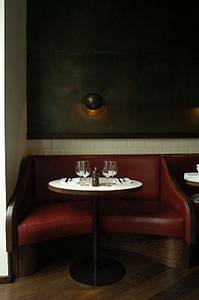 There, the menu and style adhered to the gospel laid down by Fergus Henderson, the celebrated chef who introduced Londoners to bone marrow on toast and robust, nose-to-tail dining at his mother ship restaurant, St John. Here, the tradition continues with simple food presentation and descriptions, ingredients which are strictly seasonal, and an inspiration and pride mined from a deep well of solid, culinary, hard-boiled Britishness. Whole crabs are served with mayonnaise, ox tongues are grilled, bubble and squeak abounds, mushy peas make their presence felt, fruit crumbles loom, codling and sand eels edge their way on to the menu. In many ways, perhaps, this is rather like a western outpost of St John Bread & Wine itself, but what could possibly be wrong with that? Hereford Road is situated in what was originally a former Victorian butcher’s shop in that part of London that is strictly Bayswater in location, but totally chi-chi Notting Hill in spirit. S remembers it as Veronica’s, a rather snooty English restaurant that was, like batwing sleeves and Kajagoogoo, popular in the Eighties. Today, behind a kindling of fennel sticks and a stack of squashes displayed in the window, Pemberton’s kitchen is centre stage: the chef and his oven are the first things you see when you walk into the restaurant. At the moment he has the traditional startled rabbit look of the new restaurateur; a mixture of terror, exhaustion and the strange, strung-out exhilaration that only late working nights and early morning fish deliveries can bring. On one visit, I overheard him good-naturedly complaining that a stew of visits from restaurant critics earlier in the week was ‘too soon, too soon’ for his new business, oblivious to the fact that at least four of his customers lunching in the dining room at the time were also practitioners of that black-hearted trade. Sometimes it’s just best not to know these things. 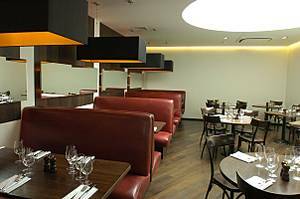 The front kitchen part of the restaurant is lined with mini-booths for two, while the rear dining room offers four capacious mega-booths lined in red leather and a cluster of wooden tables, which rather presents a territory of Us and Them. In comparison to the white tiled anteroom, with its expensive finishes and hissing burners, the rear room is simple to the point of bleakness – but once customers start filling it up, warmth will probably flow. The current Hereford Road seasonal menu reflects the deeper, richer flavours of autumn and that special moment in the year when we turn to more warming and filling dishes for sustenance. 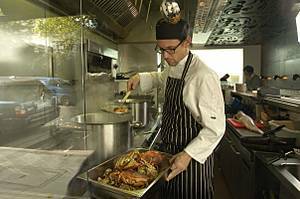 Among the dishes are hot soups enriched with cheese; smoked eels; a braise of cuttlefish with fennel and aioli; girolles on toast, hake with white beans; British oysters; and a venison and bacon pie for two to share. We try a bowl of nicely flavoured potted pork and rabbit under a lip of snowy white fat, the richness undercut by a welcome pile of cornichons. A green bean salad is laced with sorrel and topped with a soft boiled egg, the sharp drench of a shallot dressing perking up the crisp vegetable nicely. A bronzed roast grouse is served with watercress and salsify; it’s a nice bird, just a whisker overcooked on the outside, but still very good. At £19, it would be mean to complain about it. Succulent braised duck leg bobs alongside crunchy fennel in a sparkling, clear stock while another main course of cold slices of rib of beef served with a moreish, crispy little potato cake has the twin virtues of simplicity and flavour. Puddings are resolutely old fashioned. A sombre rhubarb trifle; an alpine range of meringue slathered in whipped cream and sweetly poached Victoria plums; a superb sticky date pudding that’s irresistible. In general, the cooking is slightly nervous at the moment, but Hereford Road has all the accoutrements of a fabulous neighbourhood restaurant. The wine list is well put together, with lots of choices available in small carafes or glasses. The mark ups are not steep and there are lots of bottles under £25, but at these prices it’s tempting to indulge and treat yourself to a better bottle, such as the Meursault Bitouzet-Prieur 2005 at £38, or the Saint Julien Sarget de Gruaud Larose 1997 (£36). The staff are exceptionally sweet and friendly - chilled carafes of tap water are brought to the table unbidden - and the thoroughly reasonable prices and daily changing menu have already made this a hit with S. I can’t get him out of the place. Whatever the chef-proprietor might think, it’s not too soon to say that Hereford Road is going to be a hit, and a welcome addition to the London dining scene. Hereford Road Restaurant, 3 Hereford Road, Westbourne Grove, London W2 4AB. Telephone 020 7727 1144. Meal for two, excluding drinks and service, £60.